Definition at line 57 of file llfollowcam.h. Definition at line 122 of file llfollowcam.cpp. References DEFAULT_MAX_DISTANCE_FROM_SUBJECT, FOLLOW_CAM_DEFAULT_BEHINDNESS_ANGLE, FOLLOW_CAM_DEFAULT_BEHINDNESS_LAG, FOLLOW_CAM_DEFAULT_DISTANCE, FOLLOW_CAM_DEFAULT_FOCUS_LAG, FOLLOW_CAM_DEFAULT_FOCUS_OFFSET, FOLLOW_CAM_DEFAULT_FOCUS_THRESHOLD, FOLLOW_CAM_DEFAULT_PITCH, FOLLOW_CAM_DEFAULT_POSITION_LAG, FOLLOW_CAM_DEFAULT_POSITION_THRESHOLD, mFocusLocked, mMaxCameraDistantFromSubject, mPositionLocked, mUseFocus, mUsePosition, setBehindnessAngle(), setBehindnessLag(), setDistance(), setFocusLag(), setFocusOffset(), setFocusThreshold(), setPitch(), setPositionLag(), and setPositionThreshold(). Definition at line 147 of file llfollowcam.cpp. Definition at line 250 of file llfollowcam.cpp. Definition at line 251 of file llfollowcam.cpp. Definition at line 247 of file llfollowcam.cpp. Definition at line 253 of file llfollowcam.cpp. Definition at line 244 of file llfollowcam.cpp. Definition at line 255 of file llfollowcam.cpp. Definition at line 249 of file llfollowcam.cpp. Definition at line 246 of file llfollowcam.cpp. Definition at line 248 of file llfollowcam.cpp. Definition at line 252 of file llfollowcam.cpp. Definition at line 243 of file llfollowcam.cpp. Definition at line 254 of file llfollowcam.cpp. Definition at line 245 of file llfollowcam.cpp. Definition at line 97 of file llfollowcam.h. Definition at line 98 of file llfollowcam.h. Definition at line 195 of file llfollowcam.cpp. References FOLLOW_CAM_MAX_BEHINDNESS_ANGLE, FOLLOW_CAM_MIN_BEHINDNESS_ANGLE, llclamp(), and mBehindnessMaxAngle. Referenced by LLFollowCam::copyParams(), LLFollowCamParams(), and LLFollowCamMgr::setBehindnessAngle(). Definition at line 189 of file llfollowcam.cpp. References FOLLOW_CAM_MAX_BEHINDNESS_LAG, FOLLOW_CAM_MIN_BEHINDNESS_LAG, llclamp(), and mBehindnessLag. Referenced by LLFollowCam::copyParams(), LLFollowCamParams(), and LLFollowCamMgr::setBehindnessLag(). Definition at line 201 of file llfollowcam.cpp. References FOLLOW_CAM_MIN_DISTANCE, llclamp(), mDistance, and mMaxCameraDistantFromSubject. Referenced by LLFollowCamParams(), LLFollowCamMgr::setDistance(), and LLFollowCam::setDistance(). Definition at line 234 of file llfollowcam.cpp. References f, mFocus, and mUseFocus. Referenced by LLFollowCamMgr::setFocus(), and LLFollowCam::setFocus(). Definition at line 161 of file llfollowcam.cpp. References FOLLOW_CAM_MAX_FOCUS_LAG, FOLLOW_CAM_MIN_FOCUS_LAG, llclamp(), and mFocusLag. Referenced by LLFollowCam::copyParams(), LLFollowCamParams(), and LLFollowCamMgr::setFocusLag(). Definition at line 213 of file llfollowcam.cpp. Referenced by LLFollowCamMgr::setFocusLocked(), and LLFollowCam::setFocusLocked(). Definition at line 220 of file llfollowcam.cpp. 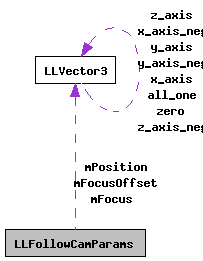 References LLVector3::clamp(), FOLLOW_CAM_MAX_FOCUS_OFFSET, FOLLOW_CAM_MIN_FOCUS_OFFSET, mFocusOffset, and v.
Referenced by LLFollowCam::copyParams(), LLFollowCamParams(), and LLFollowCamMgr::setFocusOffset(). Definition at line 175 of file llfollowcam.cpp. References FOLLOW_CAM_MAX_FOCUS_THRESHOLD, FOLLOW_CAM_MIN_FOCUS_THRESHOLD, llclamp(), and mFocusThreshold. Referenced by LLFollowCam::copyParams(), LLFollowCamParams(), and LLFollowCamMgr::setFocusThreshold(). Definition at line 182 of file llfollowcam.cpp. References FOLLOW_CAM_MAX_PITCH, FOLLOW_CAM_MIN_PITCH, llclamp(), and mPitch. Referenced by LLFollowCamParams(), LLFollowCamMgr::setPitch(), and LLFollowCam::setPitch(). Definition at line 227 of file llfollowcam.cpp. References mPosition, mUsePosition, and p.
Referenced by LLFollowCamMgr::setPosition(), and LLFollowCam::setPosition(). Definition at line 154 of file llfollowcam.cpp. References FOLLOW_CAM_MAX_POSITION_LAG, FOLLOW_CAM_MIN_POSITION_LAG, llclamp(), and mPositionLag. Referenced by LLFollowCam::copyParams(), LLFollowCamParams(), and LLFollowCamMgr::setPositionLag(). Definition at line 207 of file llfollowcam.cpp. Referenced by LLFollowCamMgr::setPositionLocked(), and LLFollowCam::setPositionLocked(). Definition at line 168 of file llfollowcam.cpp. References FOLLOW_CAM_MAX_POSITION_THRESHOLD, FOLLOW_CAM_MIN_POSITION_THRESHOLD, llclamp(), and mPositionThreshold. Referenced by LLFollowCam::copyParams(), LLFollowCamParams(), and LLFollowCamMgr::setPositionThreshold(). Definition at line 109 of file llfollowcam.h. Referenced by getBehindnessLag(), setBehindnessLag(), and LLFollowCam::updateBehindnessConstraint(). Definition at line 108 of file llfollowcam.h. Referenced by getBehindnessAngle(), setBehindnessAngle(), and LLFollowCam::updateBehindnessConstraint(). Definition at line 105 of file llfollowcam.h. Referenced by getDistance(), LLFollowCam::LLFollowCam(), LLFollowCam::setDistance(), and setDistance(). Definition at line 117 of file llfollowcam.h. Referenced by getFocus(), LLFollowCam::setFocus(), setFocus(), and LLFollowCam::update(). Definition at line 102 of file llfollowcam.h. Referenced by getFocusLag(), setFocusLag(), and LLFollowCam::update(). Definition at line 113 of file llfollowcam.h. Referenced by getFocusLocked(), LLFollowCamParams(), LLFollowCam::setFocus(), setFocusLocked(), and LLFollowCam::update(). Definition at line 107 of file llfollowcam.h. Referenced by getFocusOffset(), setFocusOffset(), and LLFollowCam::update(). Definition at line 103 of file llfollowcam.h. Referenced by getFocusThreshold(), setFocusThreshold(), and LLFollowCam::update(). Definition at line 110 of file llfollowcam.h. Referenced by LLFollowCamParams(), setDistance(), LLFollowCam::setMaxCameraDistantFromSubject(), LLFollowCam::update(), and LLFollowCam::zoom(). Definition at line 106 of file llfollowcam.h. Referenced by LLFollowCam::calculatePitchSineAndCosine(), getPitch(), and setPitch(). Definition at line 116 of file llfollowcam.h. Referenced by getPosition(), LLFollowCam::setPosition(), and setPosition(). Definition at line 101 of file llfollowcam.h. Referenced by getPositionLag(), setPositionLag(), and LLFollowCam::update(). Definition at line 112 of file llfollowcam.h. Referenced by getPositionLocked(), LLFollowCamParams(), LLFollowCam::setPosition(), setPositionLocked(), and LLFollowCam::update(). Definition at line 104 of file llfollowcam.h. Referenced by getPositionThreshold(), setPositionThreshold(), and LLFollowCam::update(). Definition at line 115 of file llfollowcam.h. Referenced by getUseFocus(), LLFollowCamParams(), and setFocus(). Definition at line 114 of file llfollowcam.h. Referenced by getUsePosition(), LLFollowCamParams(), and setPosition().